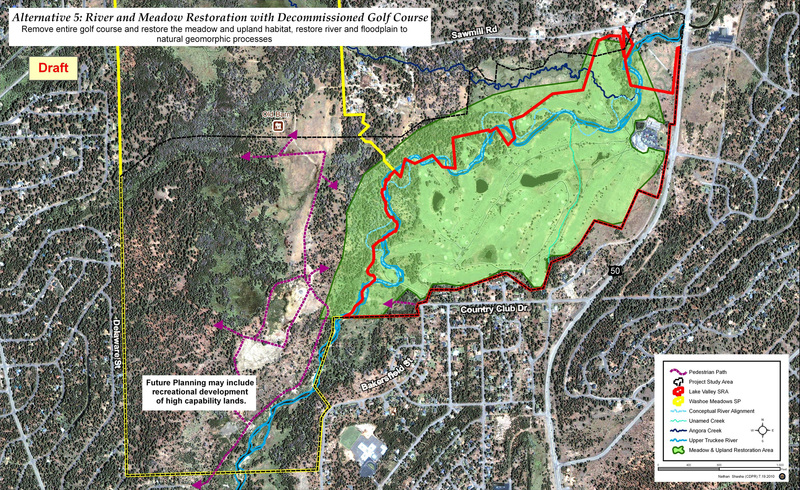 Alternative 5: River and Meadow Ecosystem Restoration / Decommissioned Golf Course This alternative would include the same river and floodplain treatment as Alternatives 2 and 3, but the golf course would be completely eliminated, although the buildings would remain. Future studies would be conducted to determine other potential uses of both park units. The area where the golf course is currently located would be restored to floodplain and meadow in stages. This alternative would include the same river treatment as Alternatives 2 and 3, but the golf course would be eliminated. The area where the golf course is currently located would be restored.